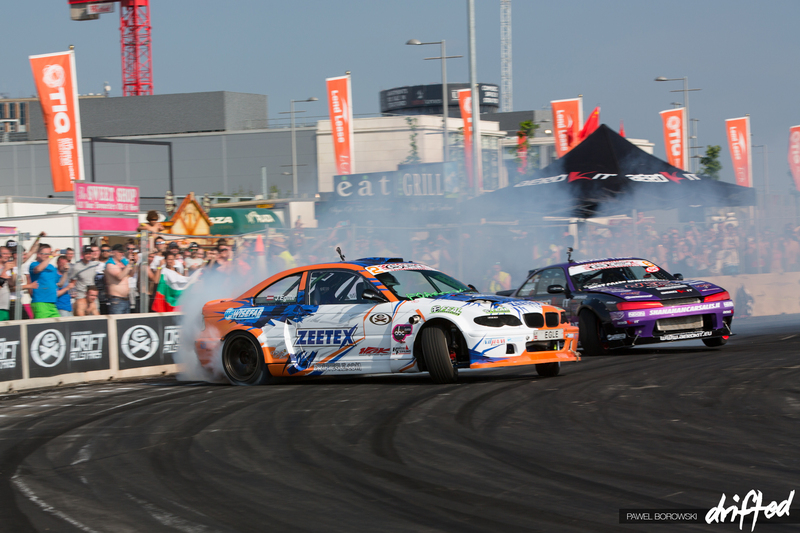 2014 sees the return of the Drift Allstars European series to the UK. 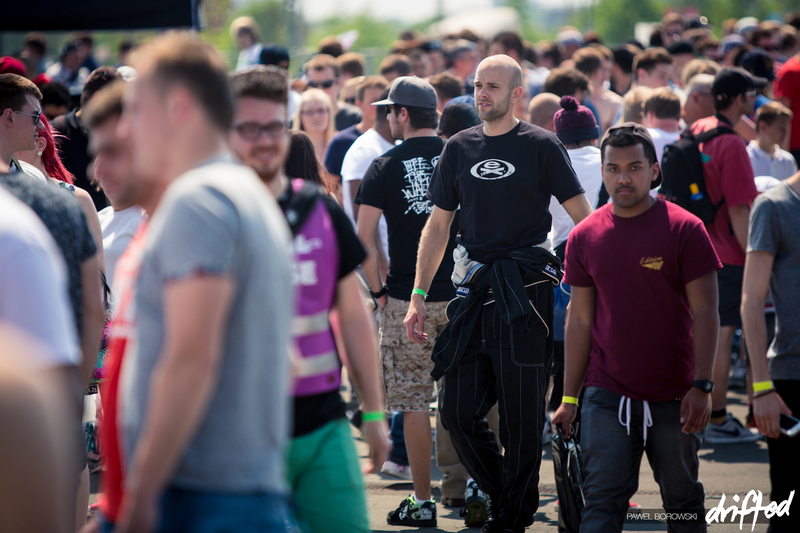 After a 2 year gap from the UK, everyone was keen to see how one of Europe’s most prestigious professional drift series had raised its game with drivers and teams. 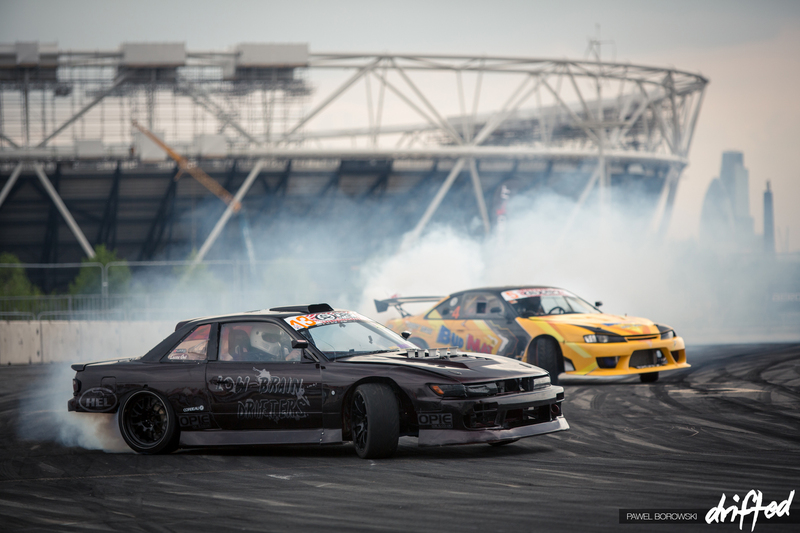 Since day 1, Drift Allstars has brought the sport of Drifting to the people. The London event would be no different. 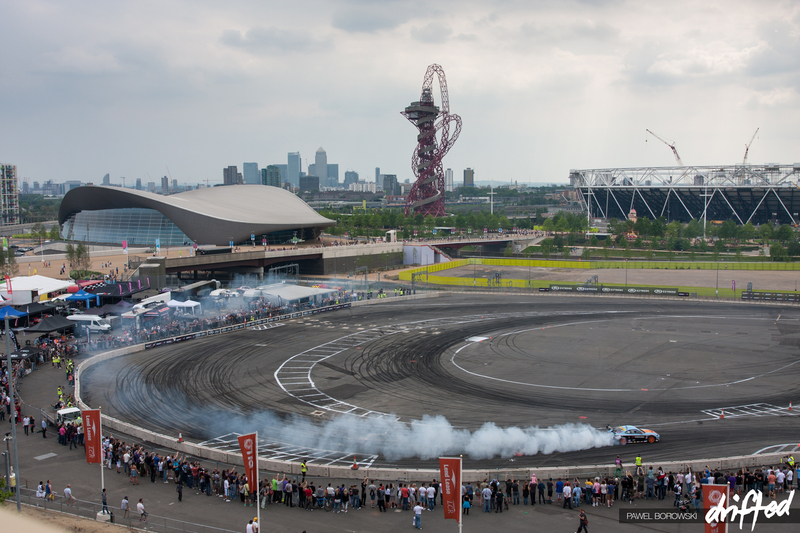 It would kick off at London’s International quarter, right beside the iconic 2012 Olympic Games stadium. The confines of the venue would make this one of the most demanding tracks of the season, but also one of the most rewarding for fans. Phil Morrison’s DW86 V8 would be on its second ever competitive outing; time would tell whether it would be up to it against some of Europe’s best drivers. 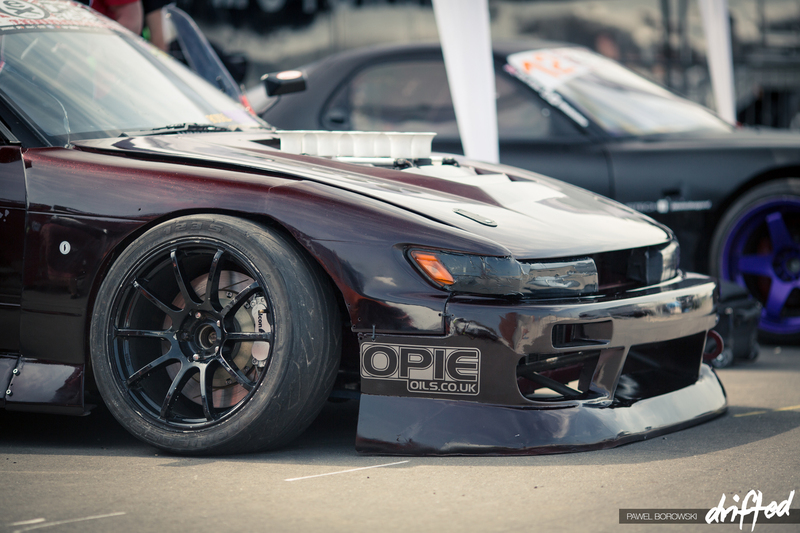 The Low Brain Drifters PS13 was back in force. Now in a new murdered out look, it looked more evil then ever! 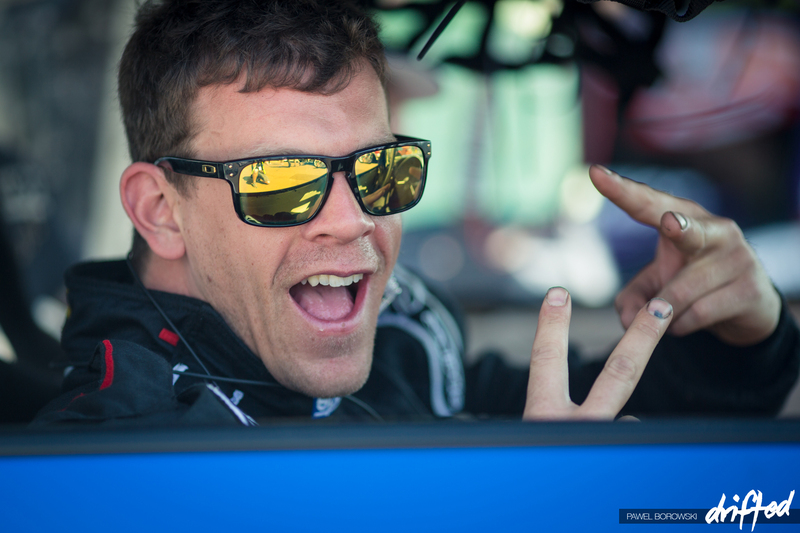 Stepping in to the drivers seat was no other then Kenneth Kenny Moen who has been killing it Stateside! 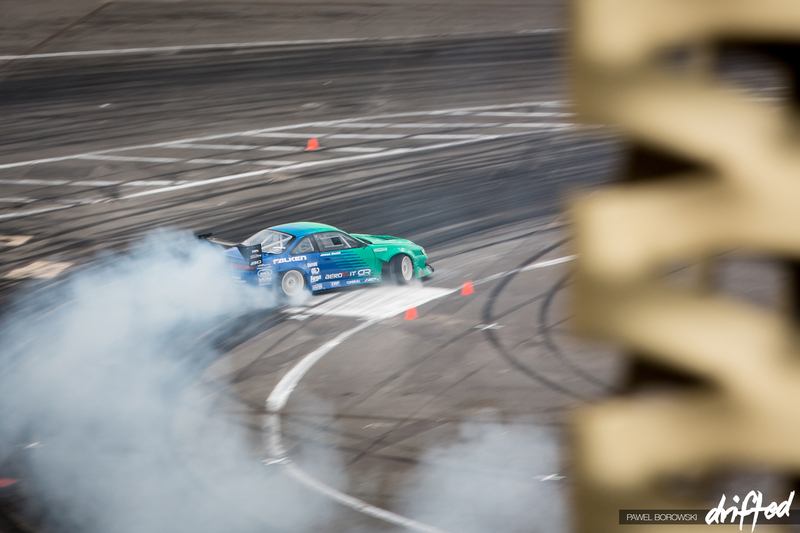 If you missed it he has had two podiums this season already in Formula Drift and lies 4th overall! Top European driver and leading Achilles tire driver; a great driver to add to this legendary car and to the series of established international champions. 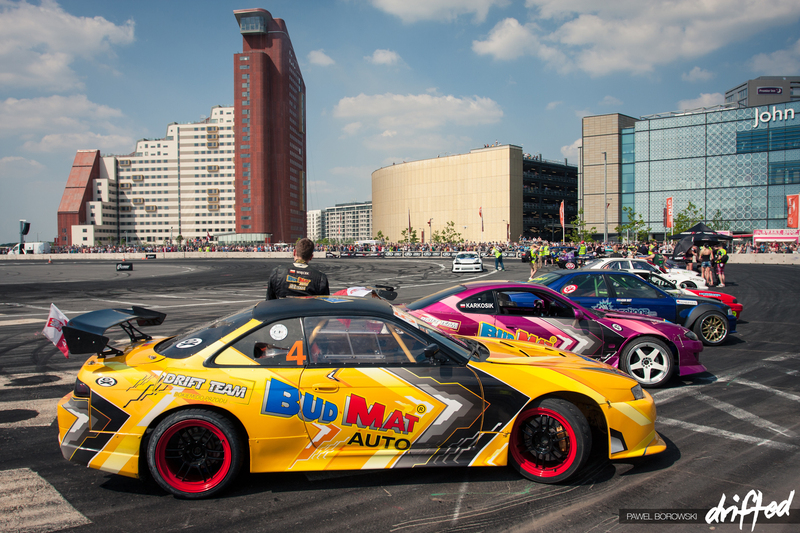 Piotr Wiecek was back for 2014 in the insane Budmat Auto S14. He came 7th overall in the series in 2013 and is out for blood in 2014. The young Polish driver has been making huge strives on the domestic stage in Poland, taking 1 win and two top qualifying positons. Could 2014 be his year? Janis Eglite, ranked number 2 in Europe, would be back for 2014, but in a totally new car. 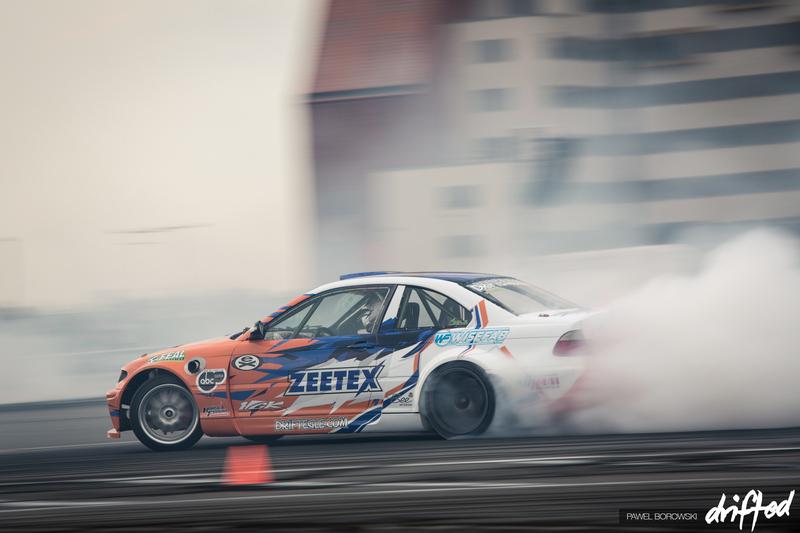 Also sporting title sponsorship from Zeetex tires, Janis is also out to make big moves in 2014 in his 800WHP twin turbo V8 BMW E46. 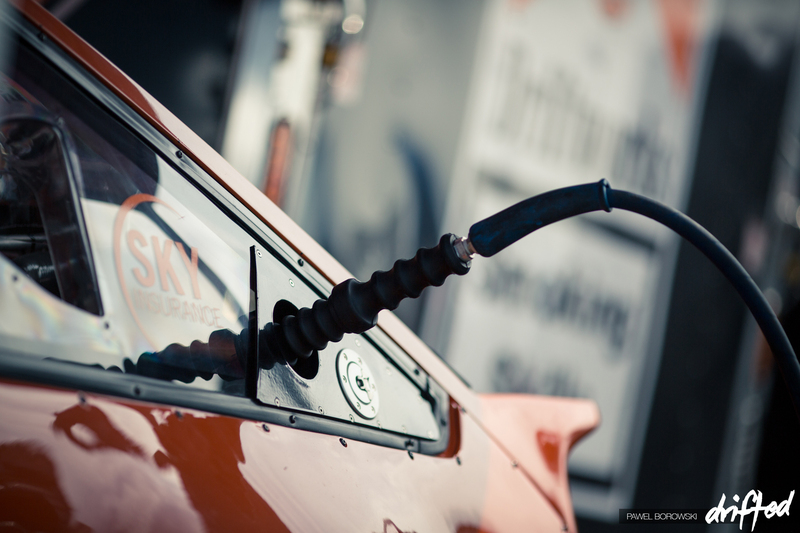 The smoke from Eglite’s car was surreal; combine that with his crazy on the edge style, he is one to watch. 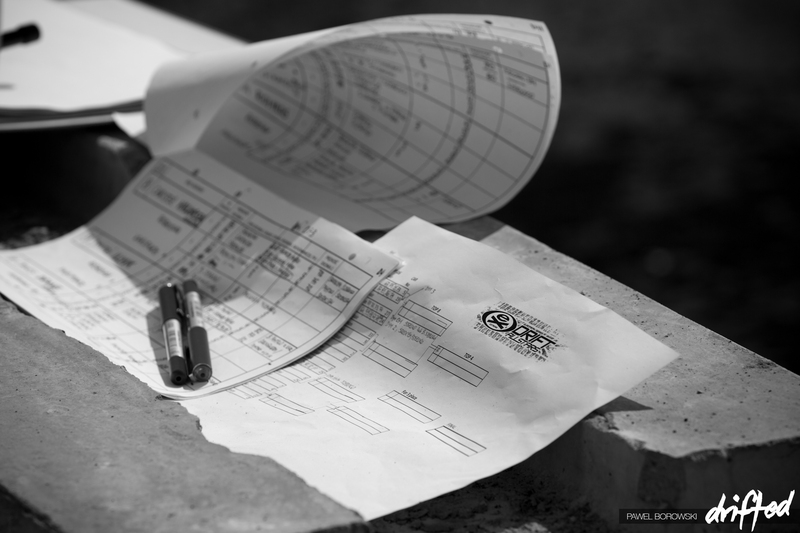 With the car having full support from Wisefab, is Eglite Europe’s Michael Essa, or is he better? Ingus Jekabbsons also made the trek over from Latvia; another driver making big moves in the European scene. James Deane would debut his all new Falken Motorsports 2JZ Powered Nissan S14; he wants to prove to everyone he is the one to beat in 2014. 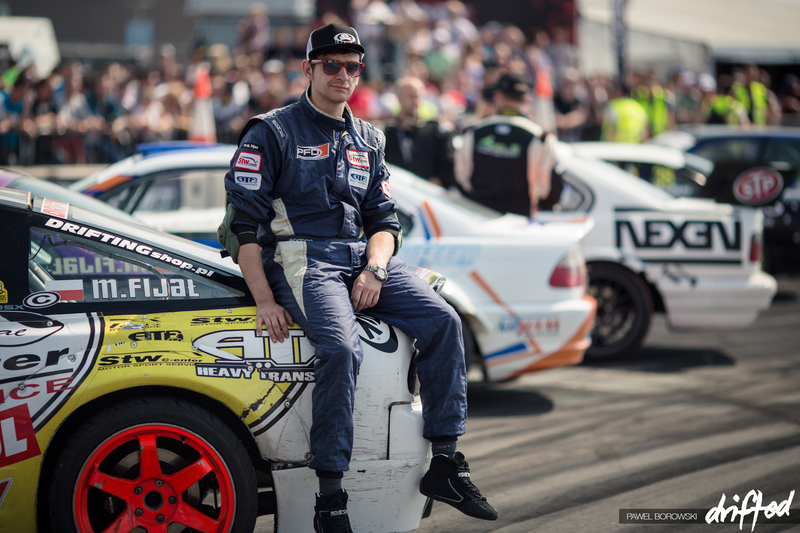 Can he be the first driver in history to earn two Drift Allstars Europe titles? Team Nexen were out in force with the Nexen N9000; the team is eagerly waiting the deliverly of the new intermediate tire which will put them back in force. With two championships with Alan Sinnot in 2012 and Juha Rintanen in 2013, can they lock out a 3rd title in 2014? 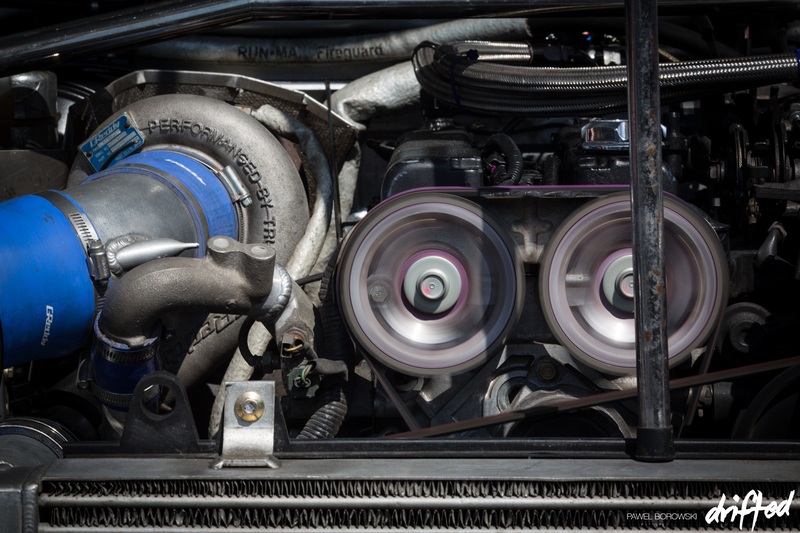 Bigger engines, bigger turbos! The sport is really turning into a power grip game, but the competition is close and the sport is evolving fast. Jack Shanahan would be running the backup Nissan S14 with an M3 Turbo setup. The young irish driver has had a great start to his season silencing many of the big names in the UK/Irish domestic series. How would he fair in the new car against Europe’s best? We are told the new 800hp Monster will be ready for RD2 onwards in the Czech republic! Nigel Colfer had some big changes to his program in the off season. With a huge amounts of upgrades to keep up with the development of the cars, Nigel has also joined the Aerokit-Nexen Tire Europe camp alongside countryman Jack Shanahan. Can Nigel bounceback in 2014 and rise back to the top. Alongside Nigel and Jack in the Nexen/Aerokit camp would be Spanish mad man Luis Lopez, known for his wild on the edge style. 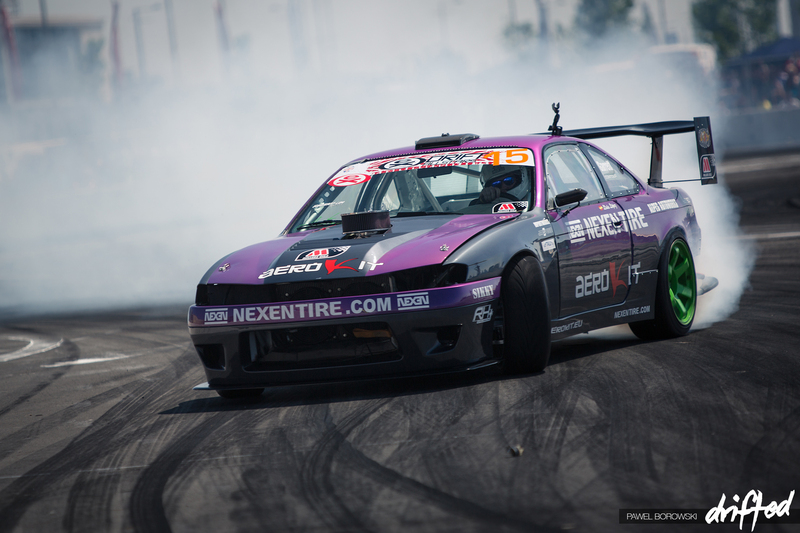 Lopez would be returning after taking a year off in his V8 Nissan S14. 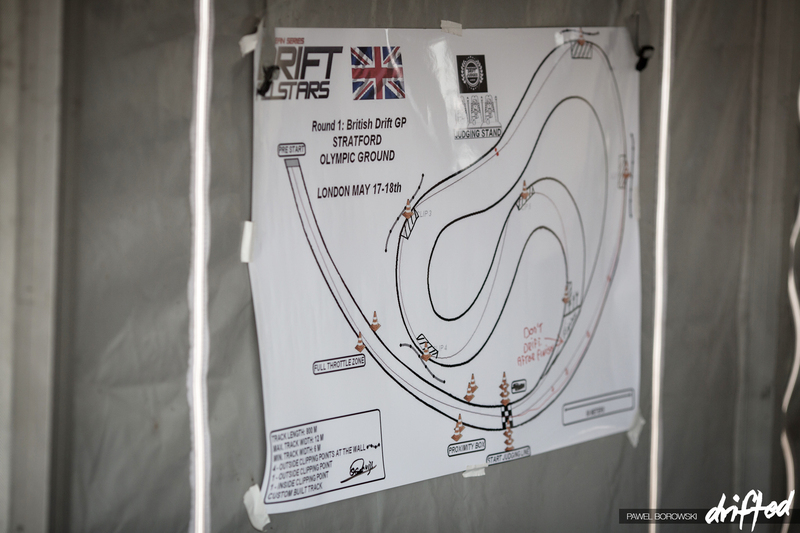 Differential ratio changes are the order of the day for custom drift tracks. Alot of the drivers swapping setups to get that ideal ratio setup for the custom track at Stratford. 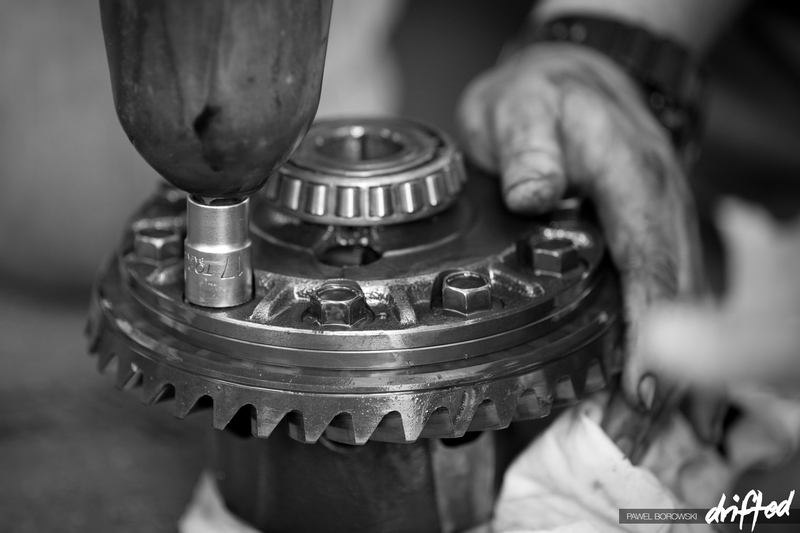 Its a messy game this drift business , out comes the crown wheel! 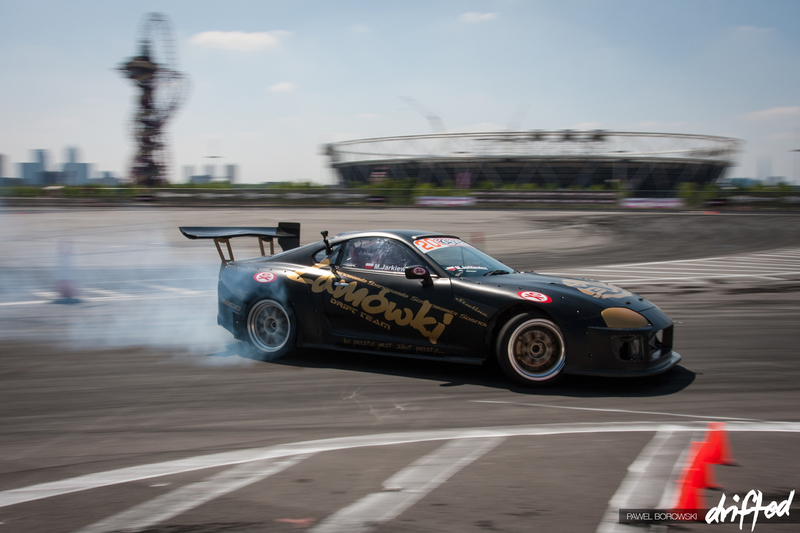 Stratford would also see the debut of Mark Webb’s new Mazda RX7 1JZ setup. He has been working hard in the off season and only finished the car the day before. It was partly cloudy on the saturday, but for once the rain of the UK stayed away! 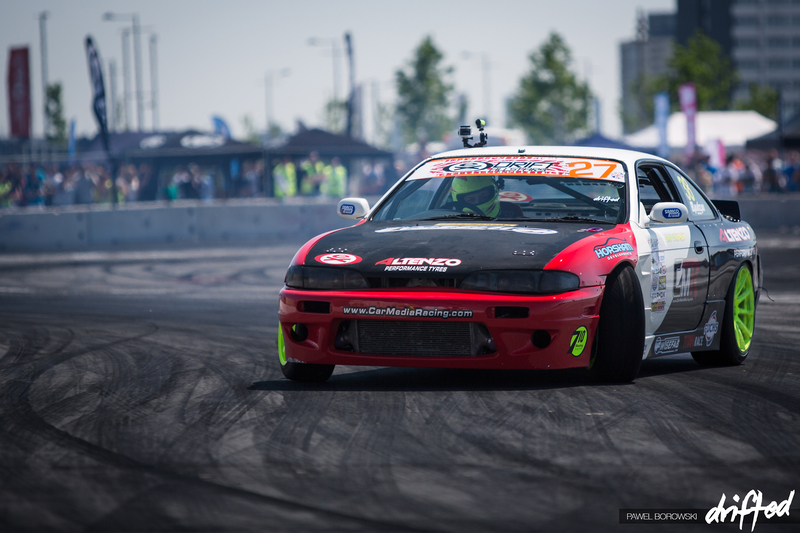 Mateusz Fijal, an up and coming Polish driver only drifting 2 years, would make his International debut in the STW 1JZ powered 180Sx . He will be one to watch in this new car after swapping over from a BMW Z3. 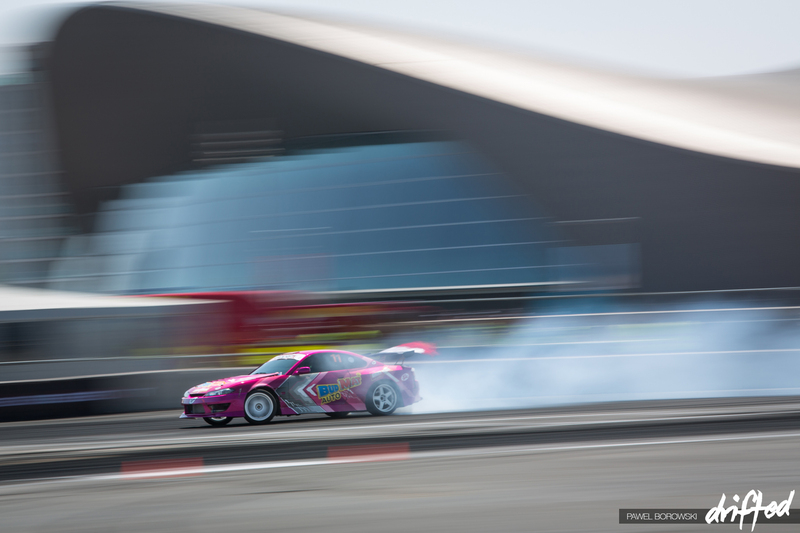 Full on custom Supra from the STW Drift Team! These guys are building their own custom Supras and they need to be seen to be believed. 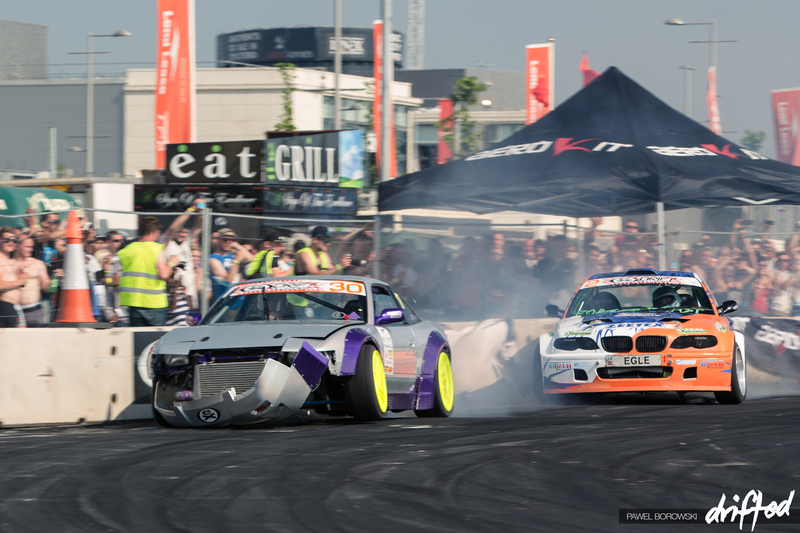 Kenny Moen and Piotr Wiecek getting some twin drift practice going! Two of the most exciting drivers to watch over the weekend with no fear on entry to the main arena. Dawid Karkosik was back in force for 2014 having come 3rd in the series in 2013. 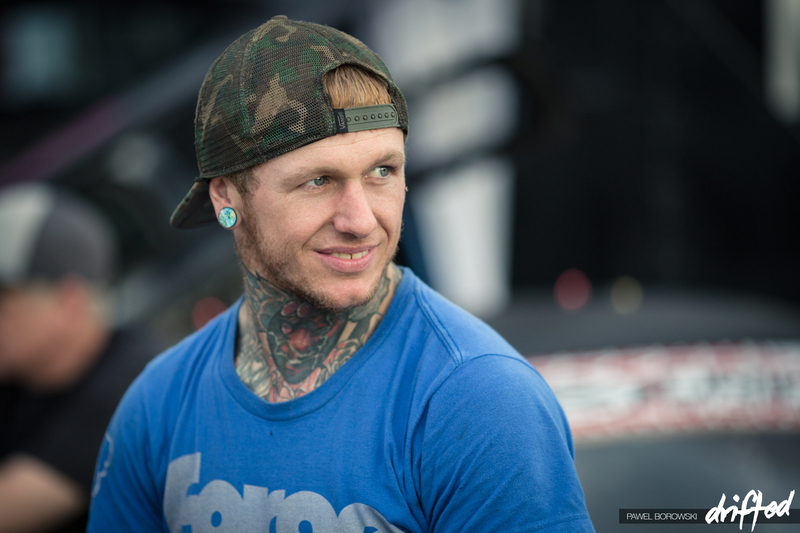 Dawid is rumoured to be debuting a new car very soon; can he push up the standings in 2013? 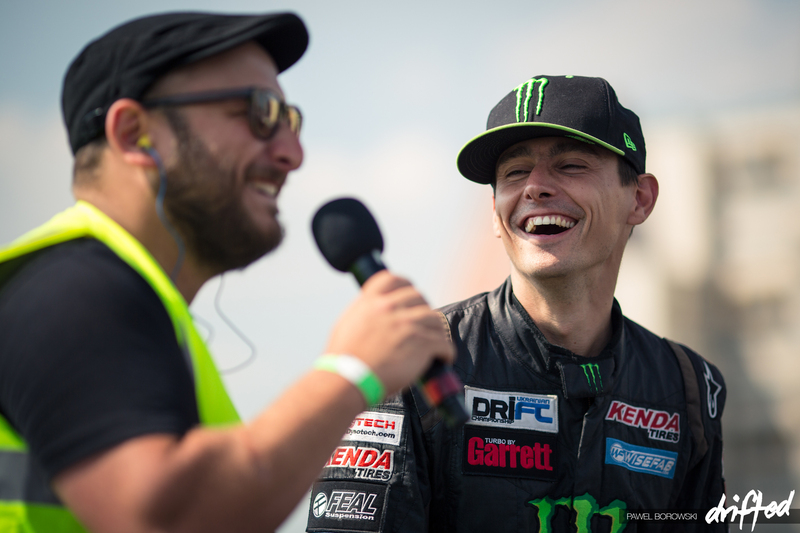 A recent win in his domestic Polish PFD series means he will have great confidence. 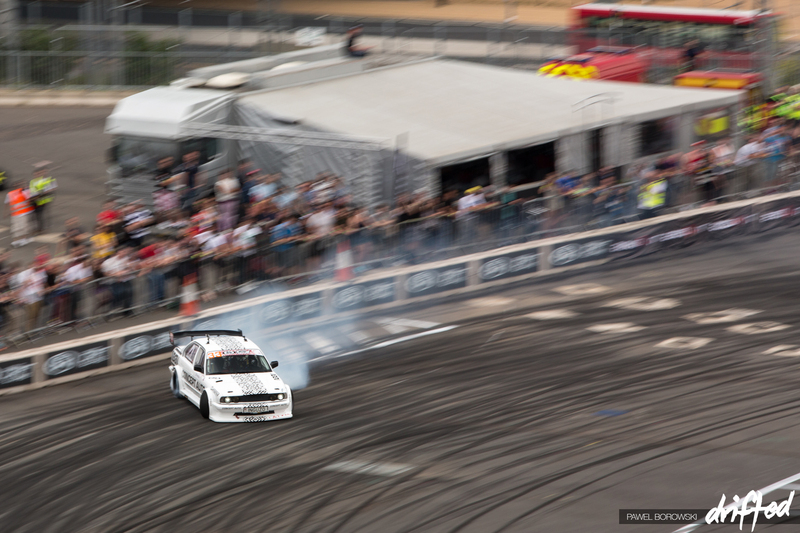 Christer Halvorsen made the trek over from Norway in his insane BMW M50 Turbo powered Nissan S15. 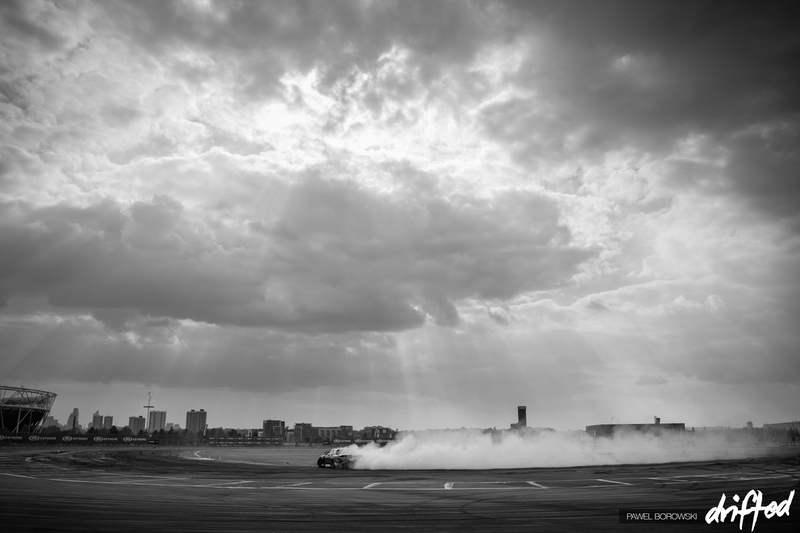 The Yokohama/Gulf Oils S15 was putting out some of the biggest smoke screens over the weekend! 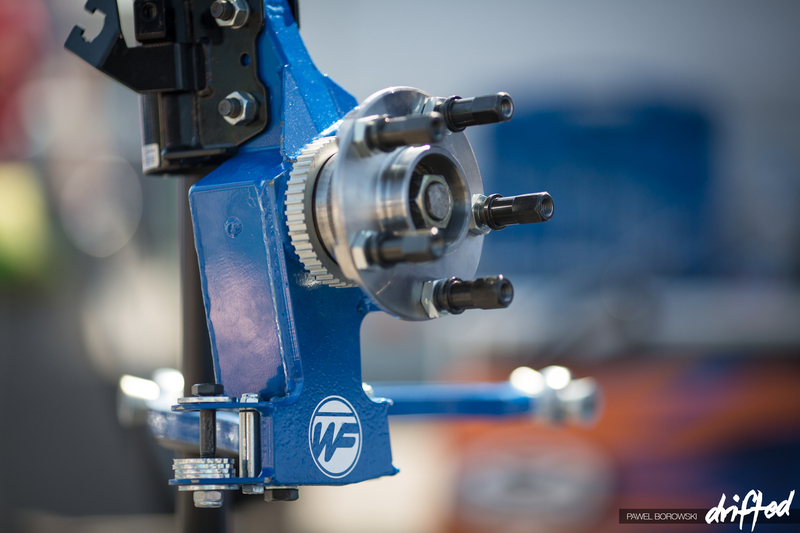 With the progression in the sport comes industry standard parts; to be at the very highest level now nearly 80% of the grid use the Wisefab angle kit and suspension kit. Has this item changed the sport for good? 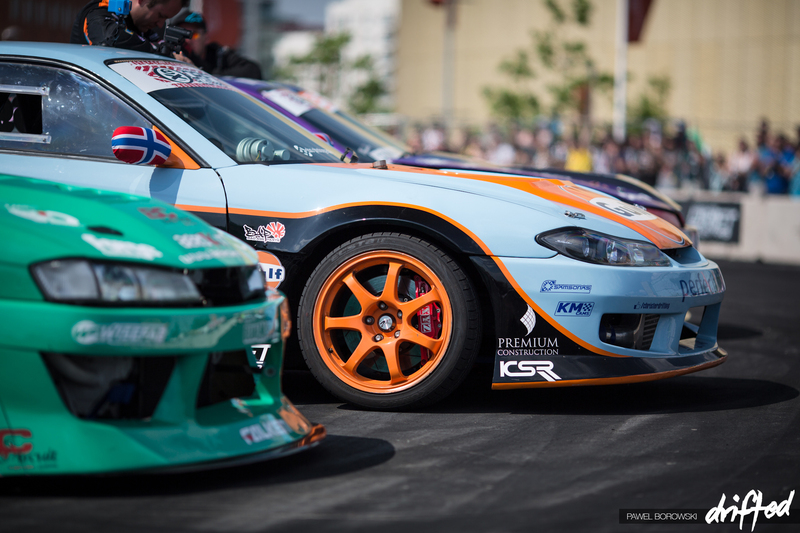 Dan Chapman was back in force in the car media racing Nissan S14. Dan, a veteran of the scene at this stage, would be keen to put it up against the International drivers on his home turf. 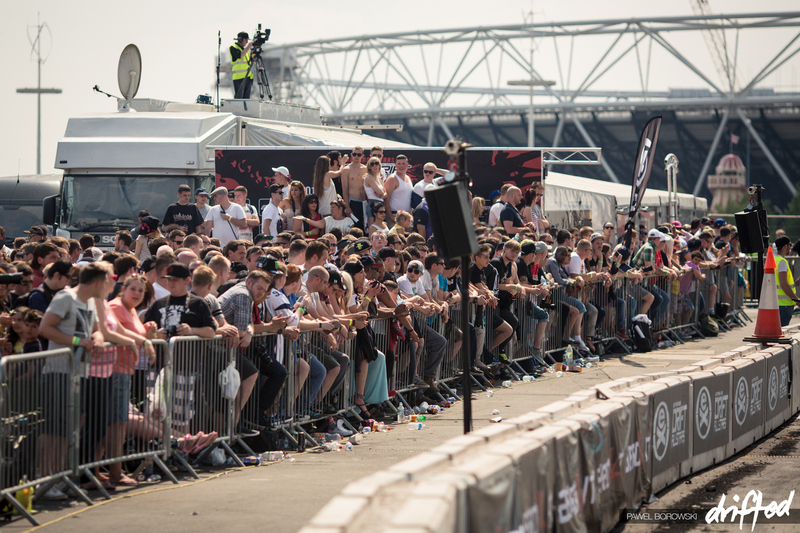 Sundays main event was nearly sold out showing the progress of the sport, up 30% in crowd numbers from the 2011 UK event held at Wembley. James Fuller deploying his air brake! Martin Richards, happy as ever! Christer Halvorsen eyeing up the competition. 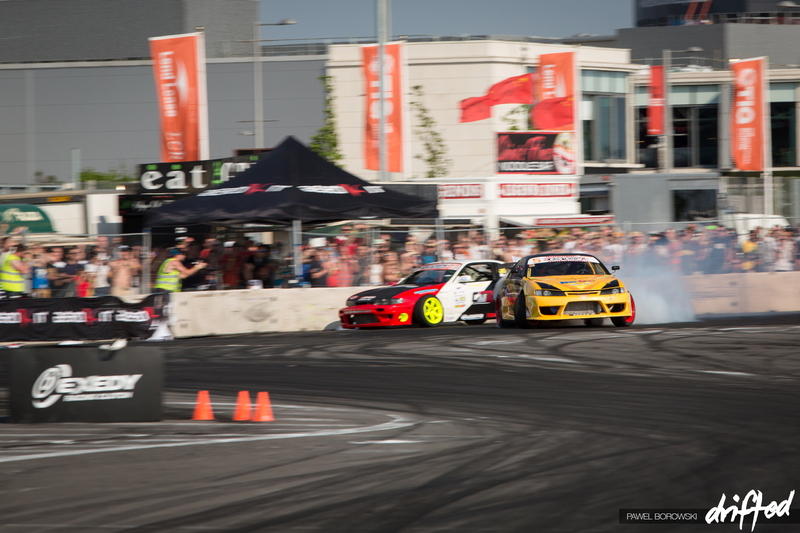 He keeps good company in Norway, with his usual sparring partners in drifting being Fredric Aasbo and Kenneth Moen. 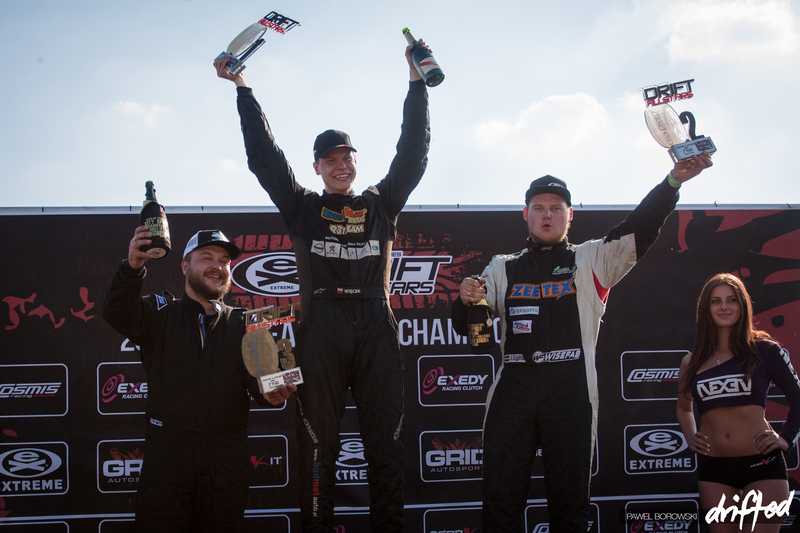 Can Christer be in the next wave of Norwegian drivers to take on the world? James Deane would push hard in Qualifying and take P4 after some clutch issues overnight. This demanding track would really test all suspension setups to the maximum, meaning the drivers with the complete package really shined. Deane was one of those drivers that had it. Janis Eglite seemed to be one of those drivers who had his driving dialed and his car perfectly setup to cater for this custom track. 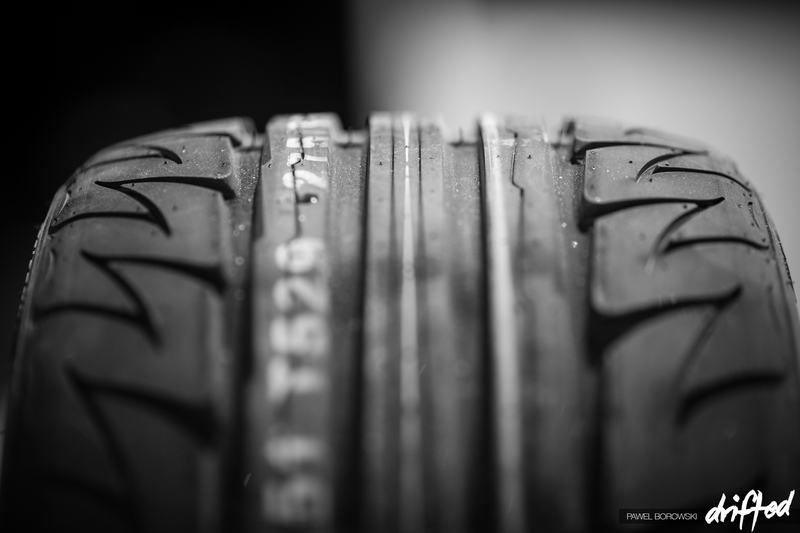 His Zeetex tires BMW accelerating forward with so much bite and his Feal suspension soaking up every bump while keeping tires on the ground and maintaining as much traction as possible. 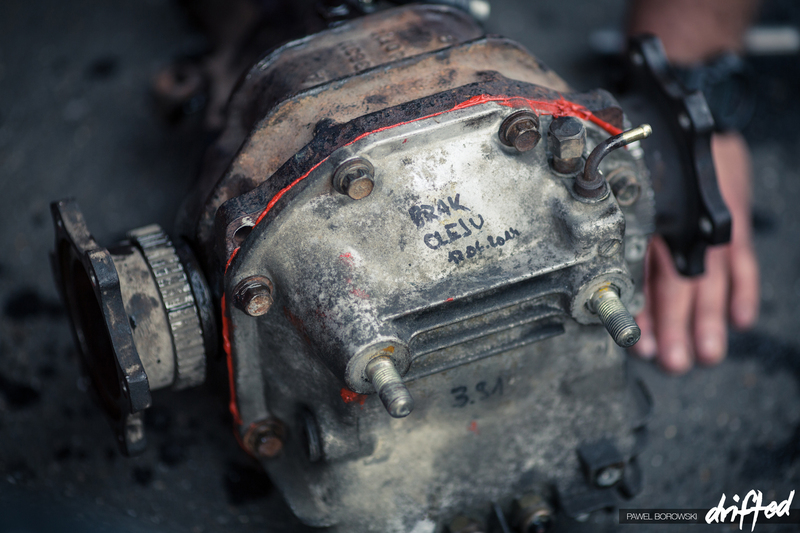 The BMW E46 Chassis works! Mateusz Fijal chilling before the top 16. 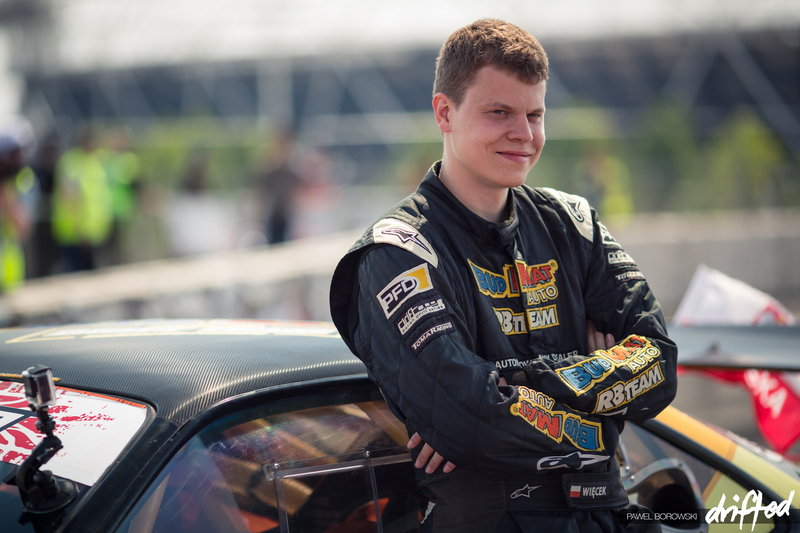 Aother young gun of the Polish scene, and one to watch later in the year as he learns and develops his car. Here we go: Top 16 Ceremony! 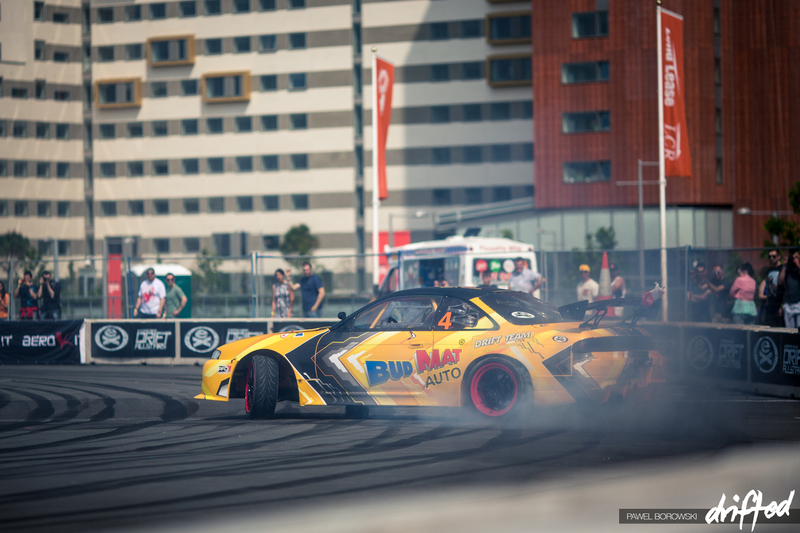 Some of the most powerful Nissan S-bodies in Europe; Drifting is getting big. Piotr Wiecek took P1 in qualifying; could today be his day? The young polish driver was certainly on a mission all weekend with his flawless driving. Faruk Kuguy has been around the scene for a while; here he is having fun with Ukrainian driver Dmitriy Misslie in his insane Nissan S13. 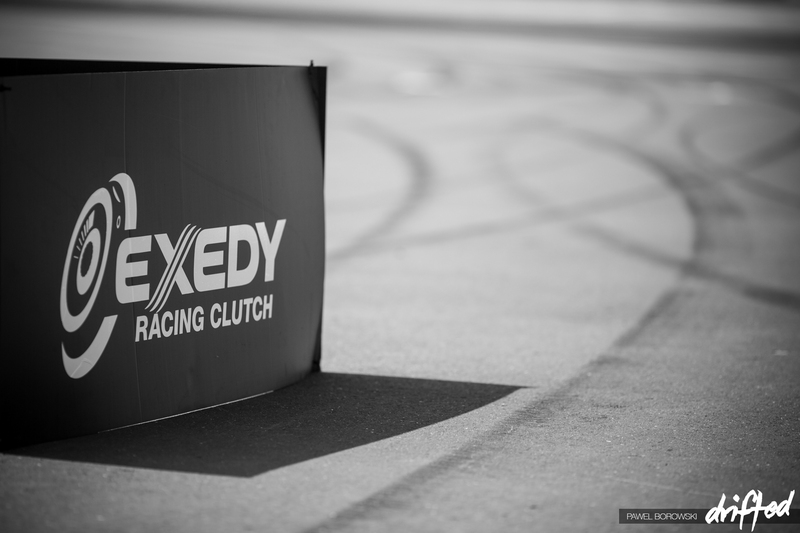 Exedy Clutches, official partner of the 2014 series and Offical Partner of Drifted! Packed out top 16! Good weather, great drivers and amazing venue: the scene was set! The pits were overflowing with fans. 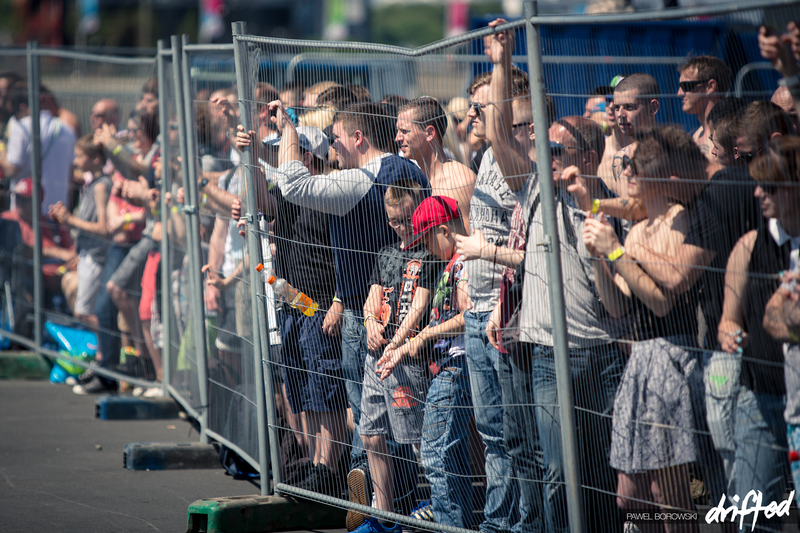 With such strict planning regulations, the DA team could not erect any temporary grandstands, but with the success of 2014 they promise to cater for this area in 2015 and improve on this event. 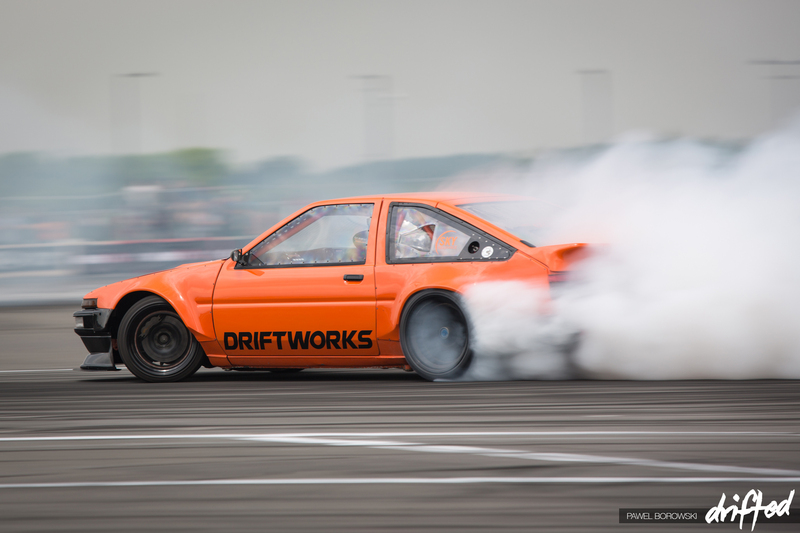 Another unique course from the Drift Allstars team. Lots of trademark walls, outside clipping points and elevation changes. 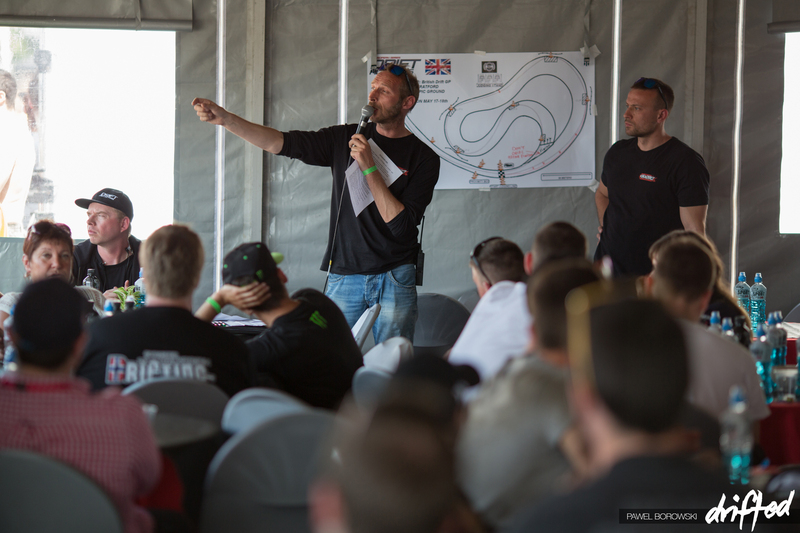 Olaf Commijs, chief Judge, now 3rd year at the helm was leading and instructing the drivers to exactly where they needed to position their cars. Lots of drivers noting this was one of the most difficult and technical tracks they had ever driven; combining a high speed entry with lots of technical clips really pushed the drivers. Ingus Jekabsons, man on a misson! Wait till you see his brother’s Ingemars BMW 6 series. Something tells me we are going to see a lot of the Jekabsons this season. So the battles kicked off. Ex-teammates of 2013 Martin Richards and Nigel Colfer would do battle, with a collion between the drivers resulting in Richards gaining a heavy advantage and taking the win. Martin Richards is now running his own team in 2014 under full backing from Altenzo tires; can he rise in the rankings and be top 3 in 2014? Dawid Karkosik pushed hard in his battle against Ingus Jekabssons, after he had an engine problem in run 1, giving Ingus the advantage. Karkosik pushed hard, but it wasn’t enough to over turn Jekabsons run of luck. One of the battles of the day was Janis Eglite in his monster Zeetex Tire BMW E46 against Nexen Tire Europe driver Jack Shanahan. The two have battled before but there was no stopping Eglite who was on a mission and put on huge pressure chasing Shanahan, giving him the advantage and the win. James Deane pushed hard against Christer Halvorsen, but his day ended early with a gearbox failure, handing the win to Halverson. James Fuller pushed too hard, connecting with the wall and ending his day. You can see Eglite also nearly in the wall. Illyuk drove hard in his battle against Jekkabsons, but a wheel coming off in the opening run was enough to end his day early. Even the judges could not predict what would happen next. 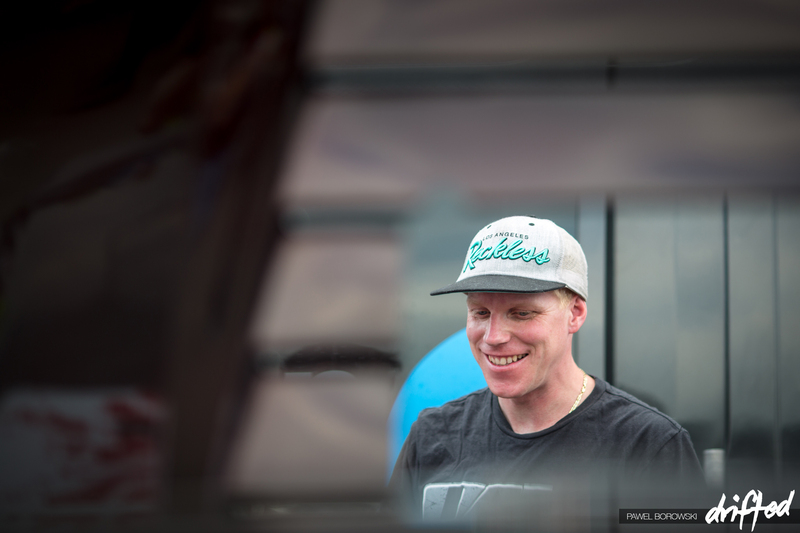 In the first semi-final Chapman overshot, hitting the wall and prematurely ending his day. Wiecek would go through to the final! In the other semi-final, Ingus Jekabssons went off-course, having a nearly identical crash to Chapman, and thus ending his day. On exiting the course, Eglite blew his engine, meaning he would not be able to start the final, gifting the win to Wiecek. The 3rd place battle would be decided by which of the cars was driveable and able to get to the startline within the remaining 5 minutes. Chapman was that driver, and thus the results were decided. 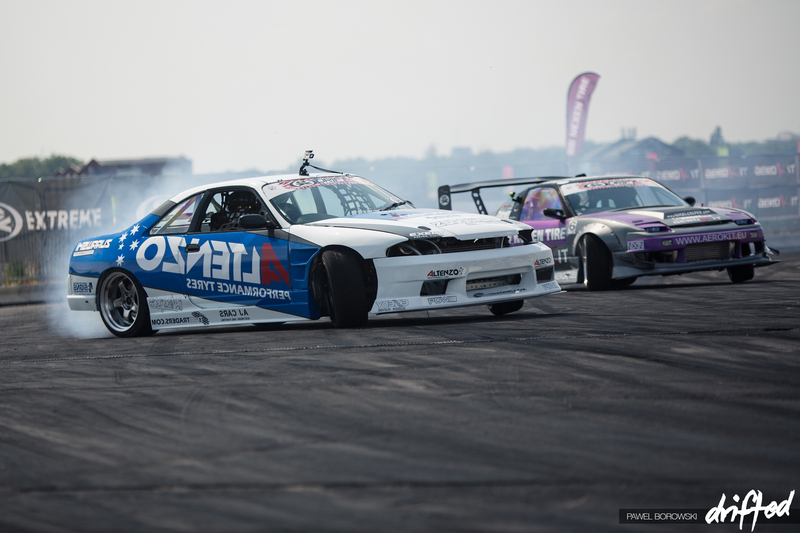 Piotr Wiecek of Team Budmat Auto RB was the British Drift GP and Drift Allstars RD 1 Winner. An excellent display of skill from the Polish driver secured his deserved position. 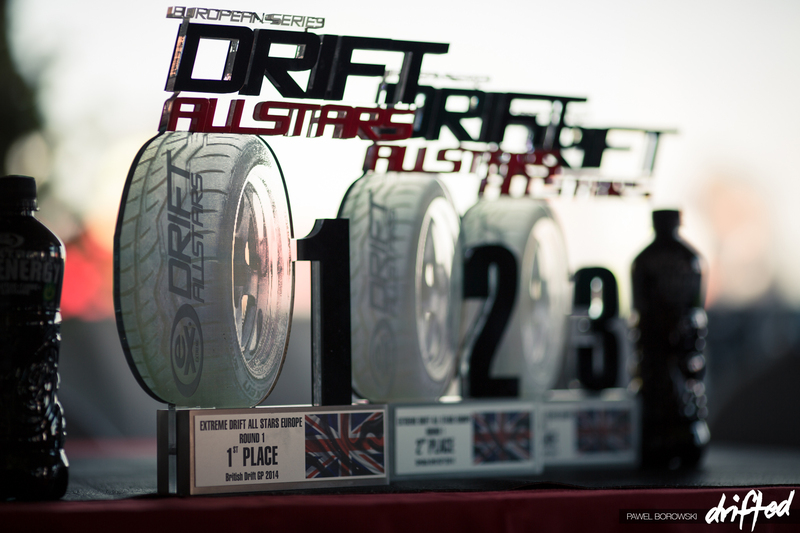 Bespoke Drift Allstars Europe Trophies. Chapman once again tasted the bubbly stuff after taking the win at Wembley way back in 2009. The top UK driver on the day. A big day for the Polish driver Wiecek. Could this be his year? The first Polish driver to take a European championship? It was a patriotic day with many Polish fans in London, many flying in just for this event. 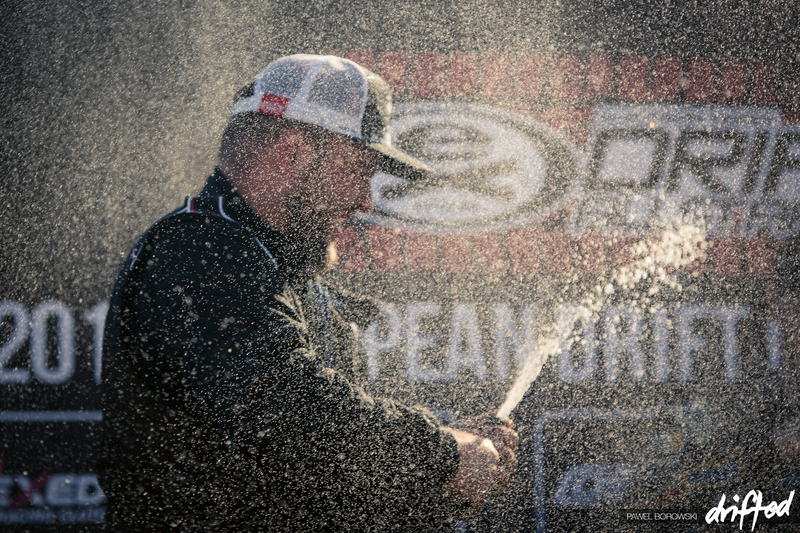 His team know how to celebrate and are sure Budmat Auto will be a force to be reckoned with this season!